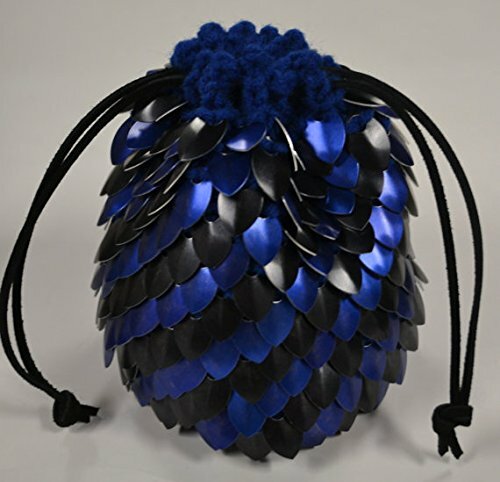 This capacious scalemail Dice Bag of Holding is knitted with black and blue scales in a diagonal stripe on blue yarn. Use it to hold your dice or any other small treasures. The outside of the bag looks like scalemaille, but the inside is soft and won't scratch your dice. The design is stretchy should you make a good haul and need a little more room. The dice in the picture are NOT included. This bag features a flat circular crocheted base 3.5" in diameter, reinforced with plastic to hold its shape. The bottom won't droop when you lift it full of dice. The circular sides rise almost 6" high. This bag will easily hold over a hundred dice. You can see all the dice I poured in it in the last picture. Even with all those dice it closed easily with double black leather drawstrings for fast and secure closure. Not your color? Contact me for custom Dragonhide or see more ready to ship options here: http://amzn.to/2aTmG2S Care instructions: This bag is handwashable, just remove the leather lacings and plastic liner first. Wash in cold and lay flat to dry.